Poori's are originally a north Indian food, but the poori and bhaji combo is something that has travelled the length and breadth of India and stayed on everywhere it has gone. So you can find it almost every part of the country.Pooris are usually eaten for breakfast, lunch as they can be a bit heavy at dinner time. A poori is a flat bread made out of a wheat flour called atta, which is commonly used in Indian cuisine. The dough is rolled out in flat circles with a rolling pin, and then fried in hot vegetable oil. When put into the hot oil they swell up with air and puff up into a balloon-type form. The pooris taste best when served immediately. Hot and crispy, they impress any guest with their puffiness. As the air is released, the pooris will gradually sink. Typically, the Bhaji is any vegetable dish made with a masala, often consisting of onion, garlic, ginger, chillies and other spices. Depending on the taste and style of the persons cooking and eating the bhaji, it can be prepared with more or less, thin or thick gravy. 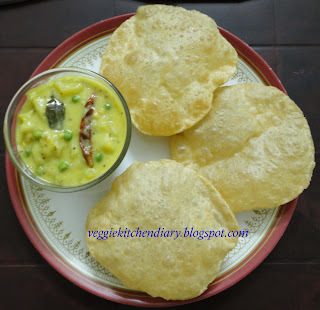 "Poori-Bhaji" (Poori-Koora, as we call in Telugu) is like a comfort food. There are billion versions of the same potato bhaji served as an accompaniment for the crispy, deep-fried pooris. Today,Iam sharing my own version of bhaji is with potatoes,Green peas, lots of onions, green chillies and some basic Indian spices. It is not spicy but mild with much less oil, which works best with its deep-fried counter-part. 1.In a bowl, mix atta, salt and sooji . Add water and kenad to make a stiff dough. (little hard dough than a normal roti dough).Cover it with a damp cloth and let it rest for one hour. 2.Divide poori dough into equal portion and round balls out of it.Flatten them to make rounds with the help of little dry flour. 3.In a kadai, heat oil for deep frying. Reduce heat to medium and fry poori one at a time till it puffs up. Turn over till both sides are golden brown. 4.Drain on paper towels to absorb extra oil and serve with Aloo bhaji. onions-2 large finely sliced length wise. 1.Wash, boil, peel the skin and mash the potatoes. 2.Heat oil in a wide pan,add mustard seeds, When they splutter, add jeera, urad dal, curry leaves,hing and green chillies. Fry on a medium heat till crisp. 3.Add onion slices. Fry on a medium flame till the onions are brown in colour. 4.Add turmeric powder and fry well. Now add mashed potatoes, green peas, salt to taste and 2 cups of water. 5.Cover with a lid and cook on a low to medium heat for 12 – 15 minutes.Mix 1 tsp of rice flour with little water and pour in to the kadai .Mix well to avoid lumps. cook for 2 more minutes.